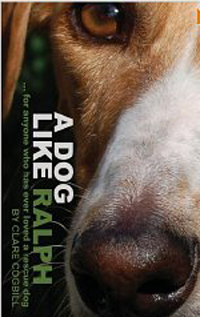 This is the humorous, sometimes sad, and eventually uplifting story of Ralph and the friends he has met along the way. He is a rescue dog with a difficult past who loves other dogs, is frightened of people and cars and mesmerised by cats and rabbits. It is partly told through his eyes and describes how what he has experienced before has affected how he interacts with those around him. Entwined with his story, Clare, his new owner and the author of this book, who has a total of over 30 years experience of working with animals and teaching veterinary nursing and animal care and welfare, tells of the joys of having him as a companion and how, through gentle nurturing, his whole outlook on life has changed. She also writes with a great deal of passion about the pitfalls of a society that has resulted in Ralph being the way he is, and of some of the other issues that are contributing to the problems faced by dogs today. Clare Cogbill Clare Cogbill was born in the mid-1960’s and, like many youngsters, from an early age she developed a deep passion for animals and their welfare. She has fifteen years experience of working with domesticated animals in rescue shelters, and as a veterinary nurse in both welfare and private practice environments. She also has over twenty years experience as a lecturer, with much of her teaching being about animals and their welfare. She is passionate about reading, preferring biographies to fiction, and where those books contain some reference to the human-animal bond, all the better. She also enjoys reading books which have been made into films, but still can’t quite work out whether it’s better to read the book or to see the film first! Clare is besotted by dogs and anything four-legged (she prefers creatures to have no more than four legs!). Most of her adult life has been spent working with, or talking about, animals. She lives in Scotland with her husband and two rescue dogs… aka substitute children, since the real child has now flown the nest and is following his own dreams. A very cleverly written book from the dogs’ perspectives and from the owner’s. Passionately written, this book made me laugh and cry and will do so for anyone who reads it, as there is something there for everyone. I enjoyed the different perspective of the same event from both the owner’s view and the dogs’ views, and laughed like a drain at the bit about the sign stuck in a mound of soil. dogs and has a great deal of empathy with them. to know how life is going for Ralph and his pack. Amazon 5.0 out of 5 stars What a beautiful book! Original, poignant and confronting, yet at times hilarious (particularly when the narrative switches to that of the ‘high maintenance’ Luella!) Clare incites deep thought as she encourages us to challenge our ingrained, often abysmal attitudes towards animals in society. I doubt anyone could fail to find a place in their heart for a rescue dog after reading this. Highly recommended +++ Can’t wait for the next book by Clare!